Today marks the 1st Anniversary for the Global Stamping Friends Blog Hop. As a new member I stand in Ahh of the talent that can be found in this group. 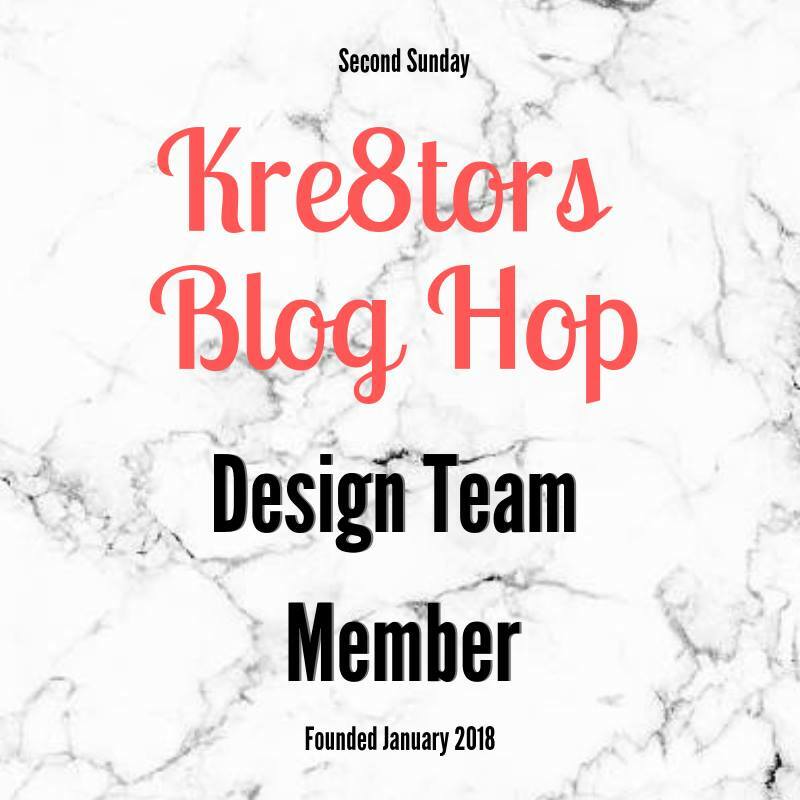 They have been together for only 1 year and are celebrating it with a special Anniversary Blog Hop. So as Sarah would say: " Grab a cup of coffee or tea and enjoy the hop". 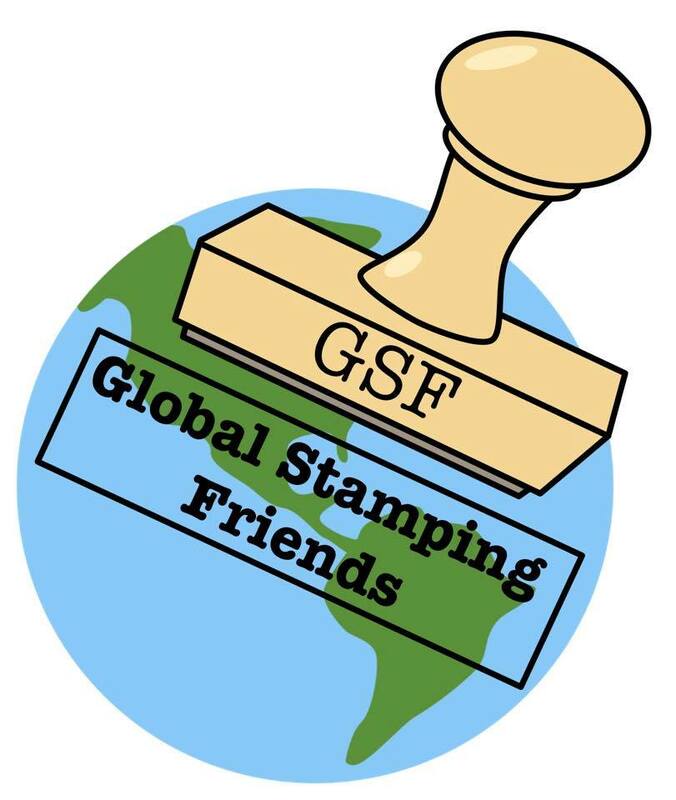 My Anniversary Card is made from a brand new stamp set that will be available 14 days from now (September 1st). 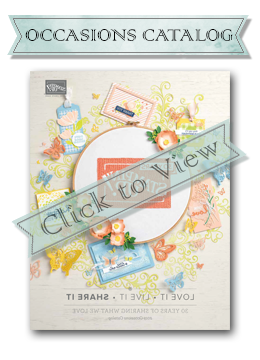 The Painted Harvest stamp set will be a very welcome addition to your fall stamp collection. 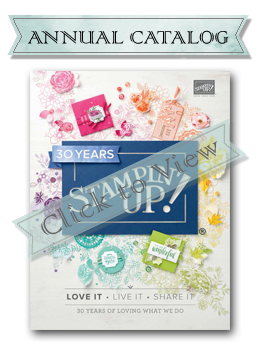 It is a 2 step stamp set with a beautiful watercolor feel. 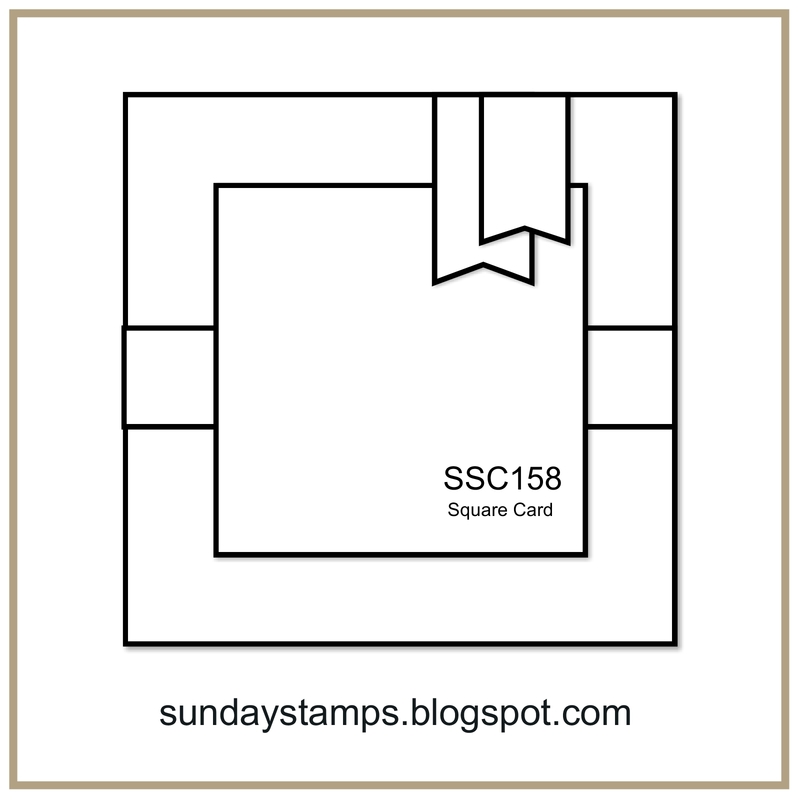 Card Base – Early Espresso Cardstock 119686, 5 ½” x 8 ½” scored at 4 ¼”. 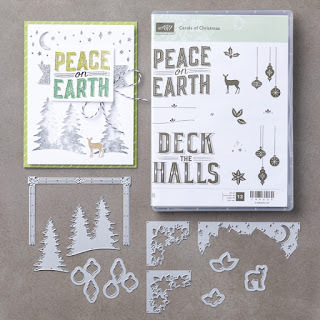 Cut 2 at 4” x 5 ¼” (one is for the Inside Layer), 1 1/2" x 3"(Label) & Scraps for the Leaf Branches. Ink – Crushed Curry 131173, Daffodil Delight 126944, Garden Green 126973 & Soft Suede 126978. 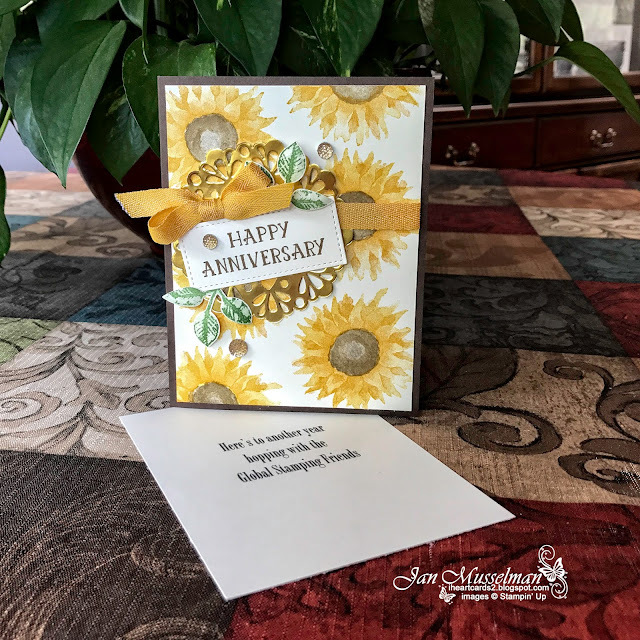 Card Front– Stamp the Sunflower backgrounds in Daffodil Delight, Then use Crushed Curry to stamp the second stamp paying attention to the direction of each stamp. Use Soft Suede to stamp the centers (Stamp off once each time) I did stamp the centers more than once to cover the area, turning the stamp slightly each time (it can get too dark, so do this sparingly). 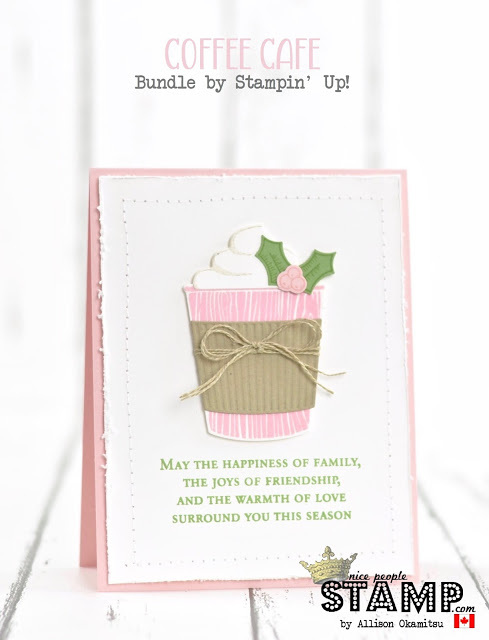 Sentiments – The Stitched Label on the Card Front and the Inside Layer are stamped with Soft Suede*. After Stamping the " Happy Anniversary" Cut it with the small Stitched Square Shapes Framelit. Leaves - Stamp the Leaf Branch with Garden Green. I Stamped off once with the background stamp onto scrap paper before stamping the leaf. Then Stamped full Strength with the detail stamp. Cut them out with the coordinating Leaf Punch. Assembly - I tied the bow onto the card front first. Slide the Gold Foil Doily under the ribbon. The Stitched label is popped up on Dimensionals. Tuck the Leaf Branches in under the Label with Glue Dots. Add the Gold Faceted Gems. *I printed out a special Sentiment for the Inside Layer Just for the Hop. 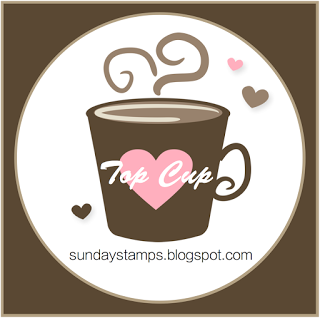 Below you will find a list of the blog hop participants. 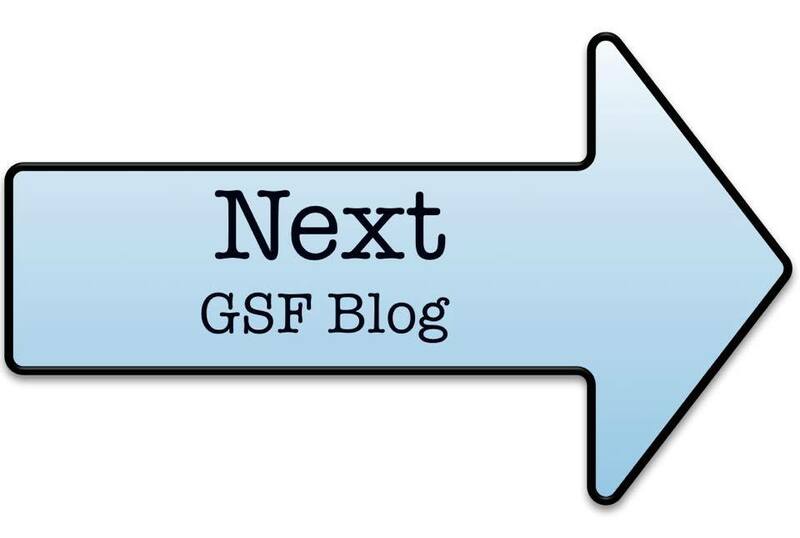 If you lose your place or happen upon a bad link( Blog Hop Gremlins). Thank you for stopping by and I hope you like what you saw here today. my online store here. Thanks for Looking! 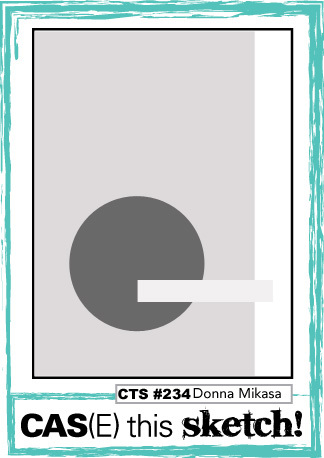 Today I am CASE-ing card made by Allison Okimitsu for the GDP100 Celebration. Each designer has created a new card. Participants in this week's challenge will CASE one of the cards - or participate multiple times and CASE several cards. 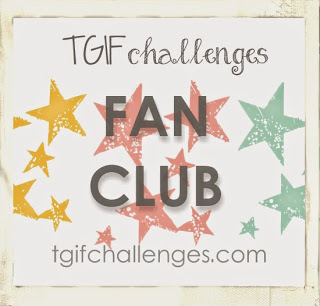 I probably started following this challenge blog back when they 1st started. It is a lot of fun participating in a celebration of this sort. 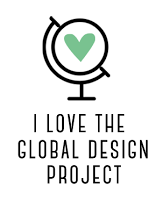 You can see the challenge at Global Design Project 100. I absolutely love the Coffee Cafe Bundle. I am an avid coffee drinker and this set is so great. The Coffee Break DSP has graphics you can cut out with the dies in the bundle. I had to buy the entire suite. So of course when I saw the coordinating Merry Cafe 144965 in the up coming Holiday Catalog I had to have that as well. 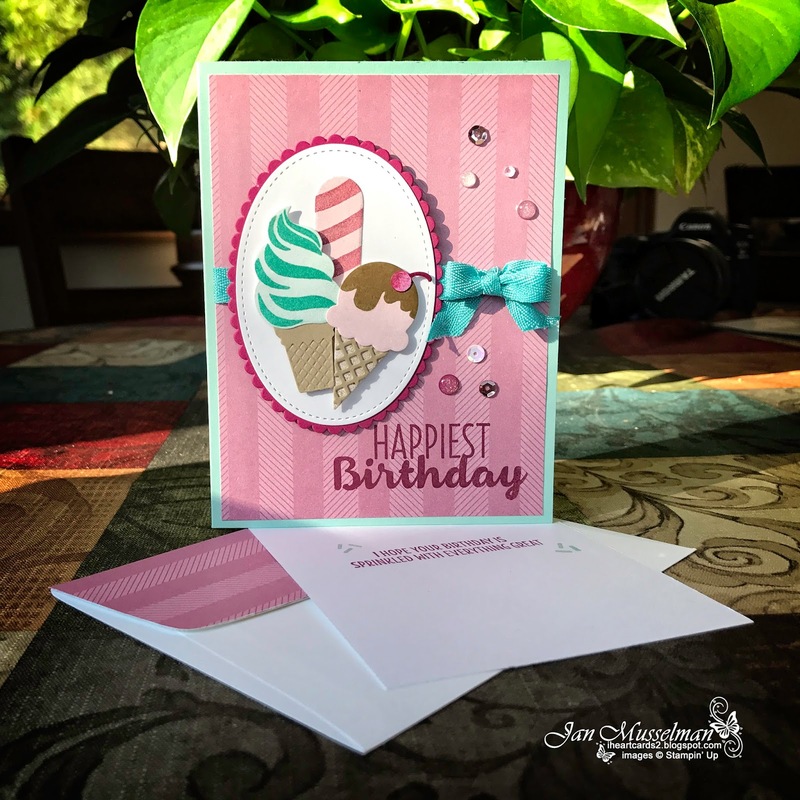 When I CASEd Allison's card I knew I was going to stay pretty close to her design. I hope she likes it. 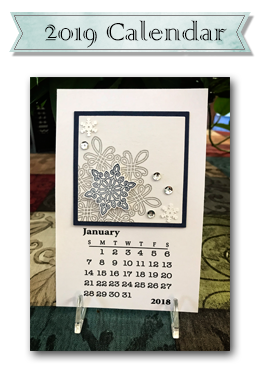 I am back today sharing another Sneak Peak from the up coming Holiday Catalog, which will be available starting September 1st. Unless you are a demonstrator. We are able to order a whole month in advance. I like that a lot. 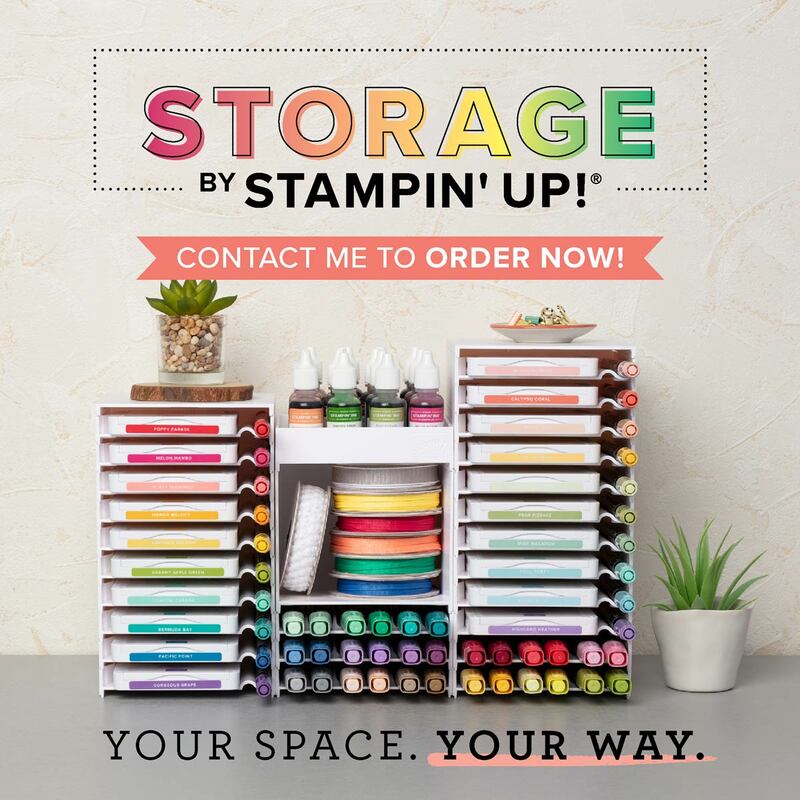 If you would like to join my team and Get $125.00 worth of Stampin' Up product for just $99.00 you could order now too. Please contact me. 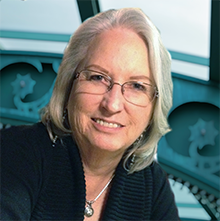 I would love to help you. 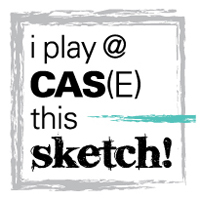 So, today I am play with the current challenge on the CAS(E) this Sketch Blog. I am really enjoying the Spooky Cat stamp set. There is even a new Cat Punch to go with it. 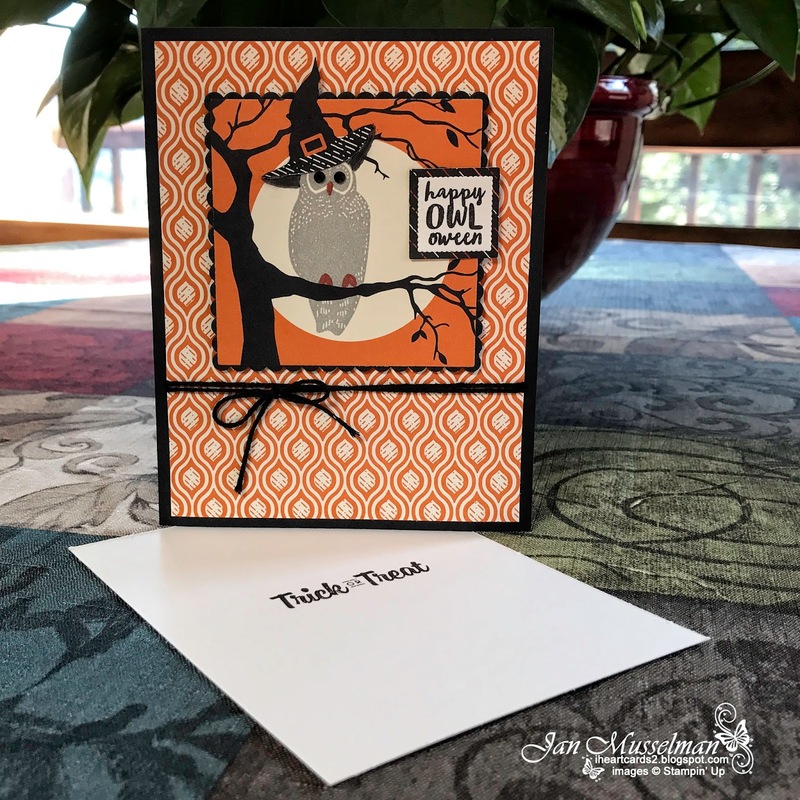 Of course you have to get the Spooky Night Designer Series Paper that goes with it too. Base - Basic Black Cardstock 121045, cut at 5 1/2" x 8 1/2", score at 4 1/4". Card Front - Spooky Night DSP 144610, cut at 4" x 5 1/4". Inside Layer - Very Vanilla Cardstock 101650, cut at 4" x 5 1/4". Focal Point Layer - 3" x 3" piece of the Spooky Night DSP (It has the tree and the moon already there). Focal Point Mat - Basic Black Cardstock. Very Vanilla scrap - Sentiment. Sentiment Mat - Spooky Night DSP. Witches Hat - I cut this out of another sheet of the same DSP pack. Black Rhinestone Jewels 144639, the owls eyes. Ink - Smokey Slate 131179 & Basic Black 121045. Marvelous Marker - Cajun Craze & Basic Black ( available in the Neutrals Collection 131261). Stamp the Owl in Smokey Slate. Color the beak and feet with Cajun Craze. I added a little more dimension to the hat by coloring in the underside of the hat brim with Basic Black. Then glue the hat on. Add the Black Rhinestones to the eyes. Glue this piece to the scalloped mat (I used the largest Scallop Framelit). I also cut the 3" X 3" Focal Point Layer with one of the Layering Squares Framelits to fit on the Scalloped mat. The sentiment was stamped in Basic Black. 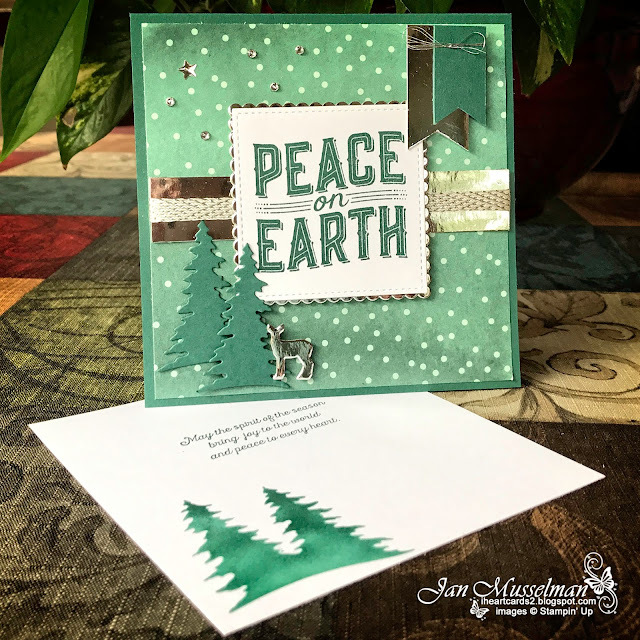 Use the Layering Squares Framelits to cut the sentiment (the smallest Scalloped Square and the next size up plain square for the mat). I popped up the whole thing onto the card front with Dimensionals. I wrapped Basic Black Baker's Twine around the card front twice and tied a bow. Glue the completed card front to the card base. Stamp the Trick or Treat on the inside layer and glue it to the inside of the card. online store here. Thanks for Looking! 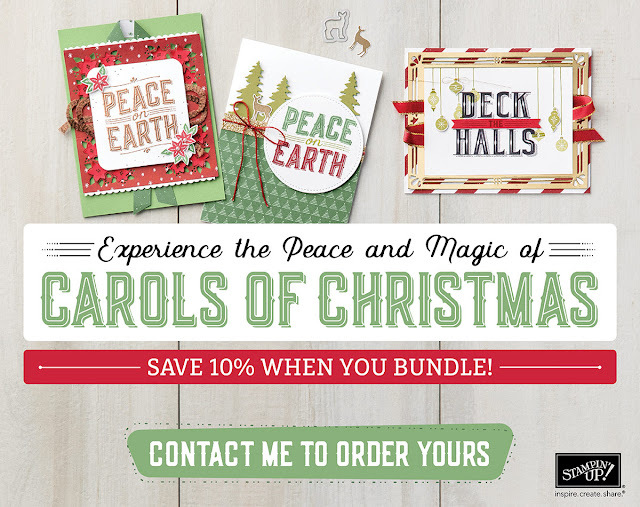 You can get a free copy of the Holiday Catalog with any purchase made in my store. Hearts Come Home Sneak Peek! Yesterday I received my pre order from the New Holiday Catalog. I was so excited I did not even unpack everything. 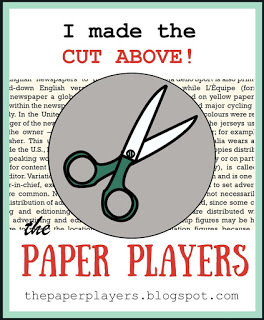 I just dived right in to making this card. This set brings back fond memories of my craft show days with one of my best friends. Back in the day, LOL, I was a Tole Painter. I had a full wood shop in my garage and I or my husband cut the wood that I would then paint to sell at the craft fairs. One of my most popular Christmas items was a wooden Christmas Tree that stood on a heart base. It came with a set of red hearts that you could put your families names on and then glue them to the tree. On the heart base was the saying "All Hearts Come Home for Christmas". The Hearts Come Home Stamps and the coordinating Hometown Greetings Edgelits Dies may melt your heart they way that they did mine. It combines 2 of my favorite things. The sentiment on the front of this card and the look of lighted houses. I have a set of Dept. 56 Houses that I put up every year at Christmas time. There is more to this set than what I am showing you today. But let me get on to the details of the card for now. Card Base - Night of Navy Cardstock cut at 4 1/4" x 11" scored at 5 1/2". 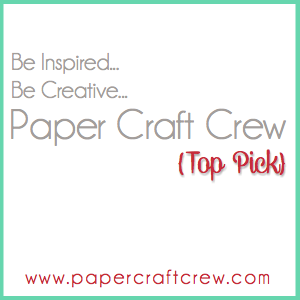 Whisper White Cardstock - cut 3 at 4" x 5 1/4 ' & 1 at 3 3/4" x 5"
Gold Foil Sheets - I used scraps of the gold foil. Most of the windows can be cut from a 1/4" strip. but well worth the time for the look it gave me. the card front with Glue Dots. I did cut some stars from a scrap to use on the front. splatter the card front to give the look of falling snow. Here is the card I created for the current challenge over at Sunday Stamps. 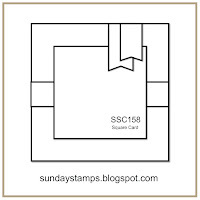 This weeks sketch is for a square card. I don't make many of these, but I could not resist playing with the Carols of Christmas early release again. This year I have decided that every time I make a new Christmas card I will make 6 of them. I think that will help me get them ready to mail out earlier this year. Of course if I see a squirrel (my favorite word for distraction), I could still get into trouble. Tranquil Tide Cardstock cut at 5 1/4" x 10 1/2". 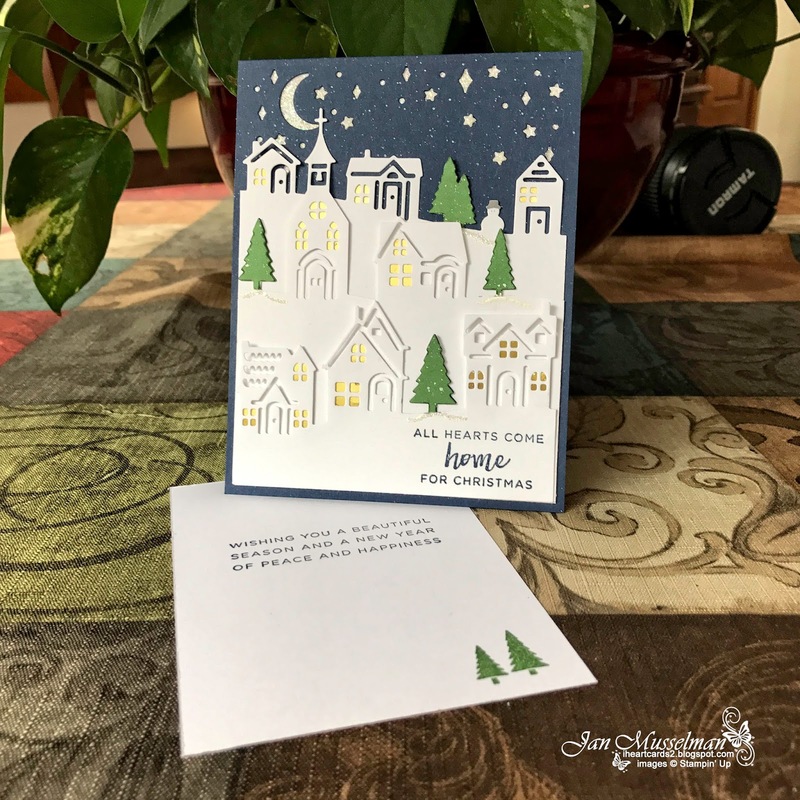 Tranquil Tide Cardstock - Cut the Trees and the smaller banner. Whisper White Cardstock - inside layer is 5" square, the focal point on the front is cut with the Stitched Shapes Framelits Dies (largest square). Silver Foil Sheet - Large Scalloped Square mat. (Layering Squares Framelits), Silver Strip 7/8" x 5", Silver Deer, larger banner. Window Sheet - I cut a stencil with the Tree Dies and then used a sponge dauber to color in the trees on the inside layer. Nature Sings Stamp Set - inside layer Sentiment. Metallic Enamel Shapes & Rhinestone Basic Jewels - Accents on the upper left corner. THANK YOU Heidi Baks for choosing my card as one of the Top Cups. Welcome to the 12th Global Stamping Friends Blog Hop. 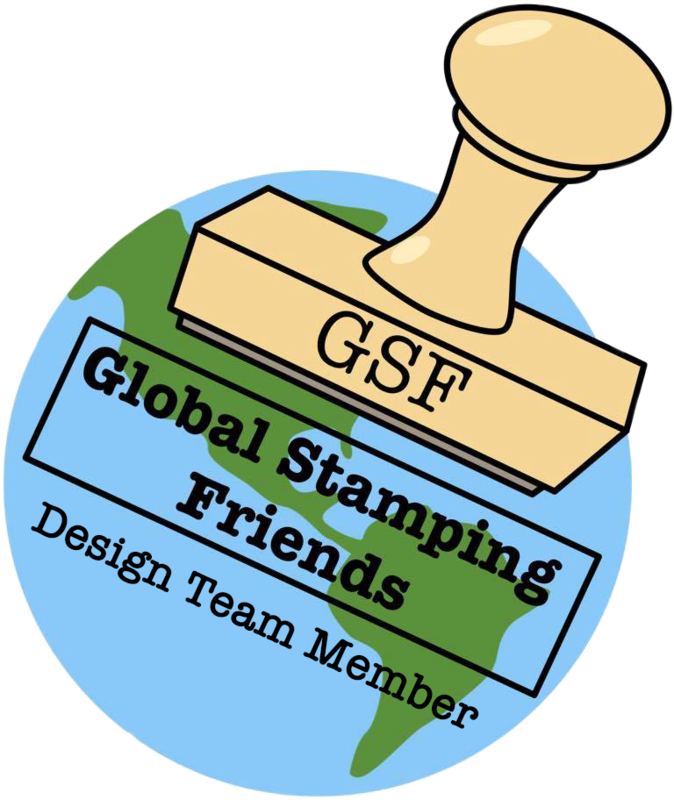 We are a group of Stampin Up' Demonstrators that enjoy sharing our creativity with each other and anyone else that has a passion for paper crafting. This months theme is Kids. 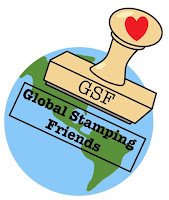 I am a soon to be Great Grand-Nana to a beautiful almost 4yr old little girl and I have started a small kid oriented collection of stamp sets. One of my favorites is the Cool Treats Stamp set and the coordinating Frozen Treats Framelits. There are so many possibilities within this set. So after I had decided on a color scheme I just stamped and cut multiple ice cream cones and bars and put them together. So much fun. I have all these lovely left overs for future projects. Card Base - Pool Party Cardstock 8 1/2" x 5 1/2", scored at 4 1/4"
Card Front - Petal Garden DSP 4" x 5 1/4"
Embellishments - Glitter Enamel Dots, Metallic Sequins & Bermuda Bay Mini Chevron Ribbon. 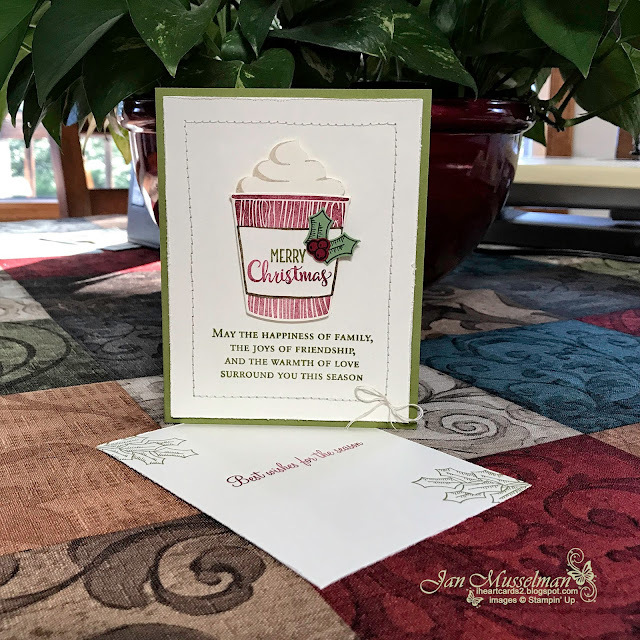 You can get a jump on making your Christmas cards if you order the Carols of Christmas stamp set and coordinating Card Front Builder Thinlits. When you buy the bundle you save 10%. Just click on the above image and you will be taken to my store.